Alexandrina Victoria, 1819-1901. Queen of the United Kingdom of Great Britain and Ireland, 1837-1901. 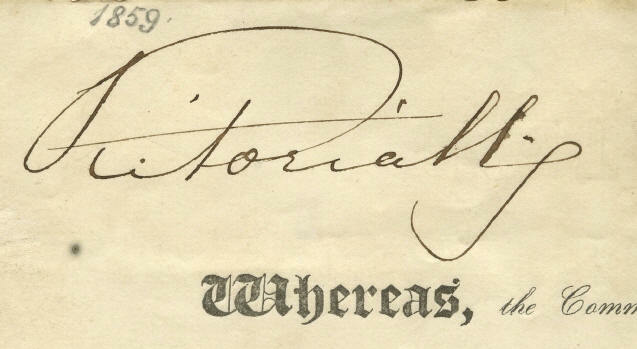 Large 3¾" signature, Victoria R, in brown ink, removed from a document. This signature, which is dated 1859 in another hand, is richly matted in cattail suede and brown. 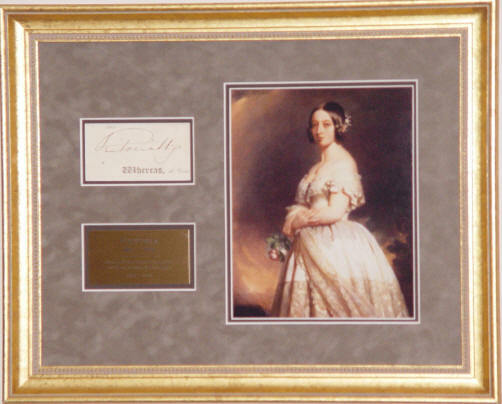 It is framed in gilt with a contemporary portrait of the youthful Queen and an engraved brass plate. There is one small spot below the “i" in "Victoria,” but it does not affect or detract from the bold signature. The signature is in fine condition. A History In Ink framed original. British royalty items that we are offering.